The biggest secret brand marketing hack is all around you: your employees should be the first, and most effective, part of any brand marketing strategy. All brand marketers are looking for affordable AND effective channels to evangelize their company's messaging. Yet, some overlook an untapped brand marketing resource right before their eyes: employees and contractors. When done right, investing in this audience delivers dividends over time. 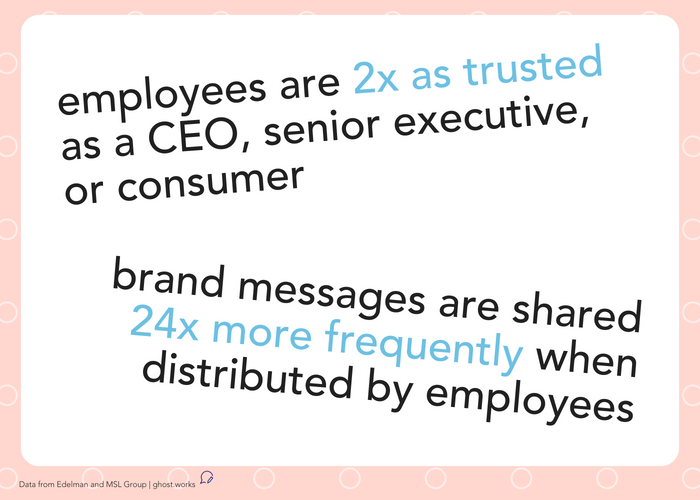 Employees become part of a strategy to disseminate content and share brand values -- all without spending much money. Every community has influencers. Companies are no different. There will be thought leaders in each department, and oftentimes they're not the people that you would expect. Make a list of those that you consider internal influencers and then methodically test this initial list against your own bias. Consider things like social media presence, participation in company initiatives, activity on the company intranet, and contributions to external professional and community organizations. As a rule of thumb, you want to look for someone who has an engaging presence that other people respond to. It's those kinds of people that Internal communications initiatives hinge on. Now that you've verified your internal influencer list, it's time to segment. This stuff is often overlooked -- because there's never enough time. It seems slightly unnecessary and is an easy one to ignore when the to-do list is long. However, we don't recommend skipping this step. Ignoring the fact that different segments have different needs is dangerous. Without proper segmentation, the initiative is likely to fail. This is because the content cannot be effectively targeted to the right segment. What's you have your segments, you'll have a pretty clear idea about which digital channels work best for those segments. You also should have some insights into which you might want to experiment with, such as increasing employee use of mobile apps or using a chatbot to engage with employees. In the most recent Gatehouse study, the majority of respondents were aiming to increase usage of mobile tools by employees, for example. 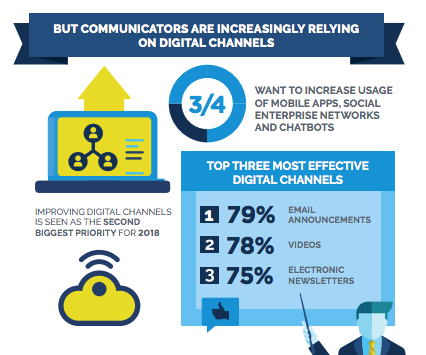 Data from Gatehouse 2018's report on internal comms. The reason for this step is that you want representation of influencers across the different channels you're looking to engage with. This helps disseminate the content across as many channels as possible, increasing the ROI on content already created. It's important to recognize that not all digital channels are created equally, just like all influencers are not the same. Remember that any perks you offer must be managed. So if you're going to do a leaderboard, especially via vendor, you'll need to allot resources to manage the project. You can offer other perks, just be sure that you deliver those perks accurately as promised and on time. Disillusionment is easy when promises are made and not kept. Take pictures of any perks earned by employees -- and promote those as well! Bonus points if you can convince your executives to lead by example and develop strong sharing sensibilities across the most important digital channels. Gallup found that only 13% of employees strongly agree that their leaders are effectively communicating with the organization -- a cogent strategy that involves leaders could provide organizational benefits beyond free distribution for your brand marketing messages! Sales enablement often gets all the attention when it comes to creating content that converts potential customers. But don't forget your existing customers! They can be a fantastic resource for sharing content, and generally evangelizing your brand. Whether it's creating an official ambassador program, or simply emailing relevant articles for sharing, craft a strategy that works for your company. Clients are usually more than happy to share content from companies they love, especially if the company is responsive and relationship-oriented. When it comes down to brand marketing, it's about engaging those who care the most to disseminate the messages that matter the most. Take the time to invest in a program upfront, and the return on this minimal investment will only grow over time!